I have had lots of blessings and good fortunes in my life… not just the obvious ones, like healthy kids or financial success. But, all kinds of good things have been bestowed upon me in my lifetime that I am thankful for. I have always been fortunate enough to do and be whomever I wanted to be. (Thanks again to my parents for this confidence built into my character.) I have always been eager enough to try new things and take risks. I have always been lucky enough for most things to work out on my daily “wing-it” style of living. On my sunny road of life, there have been dark days. The first truly grief-stricken day of my life was when my maternal Grandpa passed away. He was one of my lifelines. The most devastating day of my life is etched in my memory on the day I held my lifeless baby boy after I had carried him in my womb for more than six months, only to deliver him without a breath. And, of course, with many financial success stories, there are several not-so-successful outcomes in the checking account department. It seems the past few years have held more sad days and fears of the unknown. My once optimistic, roll-on attitude has deteriorated. Lately, I’ve taken a long, hard look at my outlook on the future and how I proceed with each of my days. And, I’m starting to see a pattern. If I think negatively, the outcome will not be positive. If I only speak harsh and unfavorable words, no good will come of it. So, it’s time for a change. I already posted about my new month and my new word. This is different. I am declaring that I have faith and the patience to see the blessings coming my way. I will no longer think or speak negatively and drown in the self-pity pool of failures. Doing so, will short-circuit God in His plan for me. Instead, I am going to keep Him at the center of both the good and the bad times I experience. He will always protect and provide for me abundantly. No more complaining! 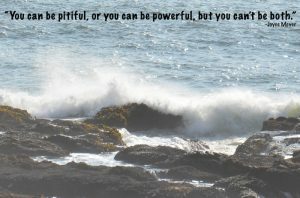 I came to this realization when one of my good friend’s asked if I wanted to be pitiful or powerful? The lightbulb went off as I looked at my life in the light of this question. I am already thankful. I am already blessed. Now, I will be powerful. 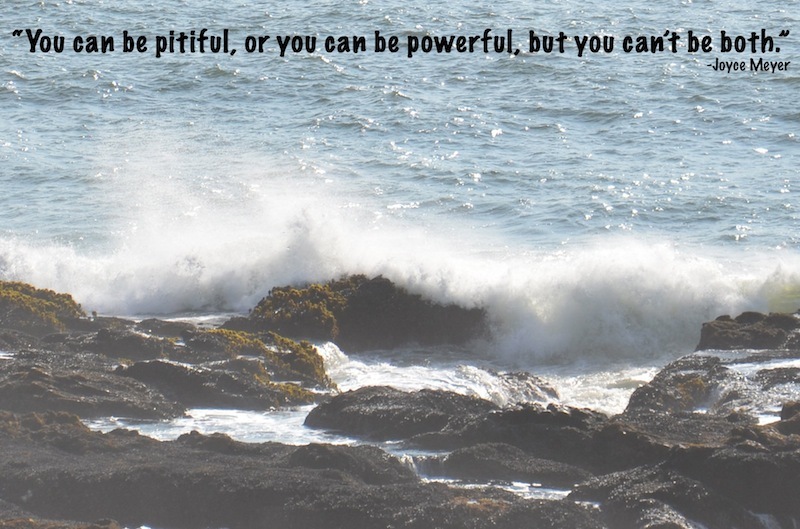 So tell me, Road Moms, do you want to be pitiful or powerful?